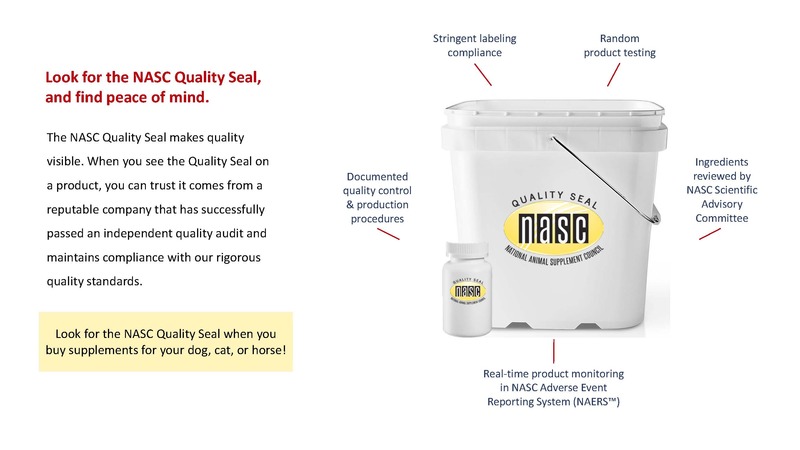 Look for the NASC Quality Seal, and find peace of mind. Have a quality control manual in place that provides written standard operating procedures (SOPs) for production process control, which helps ensure the company is providing a consistent and quality product. Have an adverse event reporting/complaint system in place to monitor and evaluate products in real time. Comply with stringent labeling guidelines for all products and all forms of labeling. Include on product labels any specific warnings and caution statements for particular ingredients that are recommended by the Food & Drug Administration’s Center for Veterinary Medicine (FDA-CVM) and the NASC Scientific Advisory Committee. Submit to random product testing by an independent lab to ensure ingredients meet label claim. 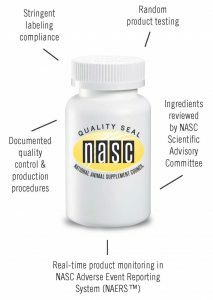 You can support NASC members by purchasing animal health and nutritional supplements that display the NASC Quality Seal on the package. Products with the Quality Seal are not hard to find—they are sold by veterinarians, pet specialty stores, farm and tack stores, supermarkets, big-box stores, and online retailers. Click here to see a list of NASC member companies that have successfully completed their quality audit.